Long-term care is the care required by a person with a long physical illness, a disability or a cognitive impairment such as Alzheimer’s disease that is in addition to the traditional medical care required by that person. Long-term care is intended to help a person live as he or she is now, rather than trying to improve or correct medical problems. 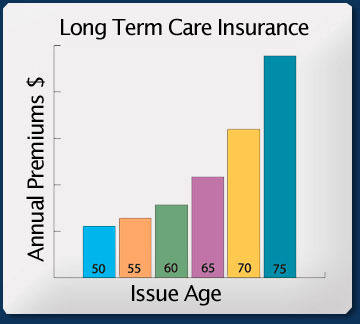 Long-term care insurance helps pay the expense of long-term care. It can help pay for home health care, assisted living facility care and more. Most importantly it helps seniors protect their assets, maintain control and alleviate family members and friends from the burdens of care giving. This is often referred to as custodial care - helps a person with the activities of daily living. Personal care is simpler than skilled care, and it may be given in a variety of settings. Long-term care in a nursing home averages approximately $50,000 per year. Care in an assisted living facility varies greatly depending on the level of care required. At the low end, the cost is slightly more than an apartment rental, whereas the addition of services can cause the cost to skyrocket. The cost of home health services is based on the level of service and frequency of the visits. A visit from a nurse 3 times a week for a year would cost in the range of $20,000, while 3 weekly visits from a home health aide would cost roughly half that amount. Click here to find the average cost of care in your area. The sources you look to for short-term, acute care typically do not cover long-term care. Private Health Insurance typically has a very limited benefit for skilled nursing care, providing coverage up for period up to 30 or 60 days. Medicare provides limited coverage for skilled care after a hospital stay of at least 3 days. Medicare provides no coverage for custodial care. Medicare Supplement Insurance is intended to pay for gaps in Medicare coverage, but does not extend to long-term care costs. 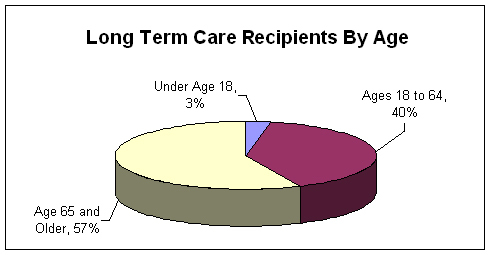 Medicaid does cover long-term care, however, Medicaid is essentially a welfare type program. The covered individual can have no significant personal assets and loses much control over healthcare decisions. Most services are provided in a nursing home rather than in a residential setting. Personal Resources pay much of the cost of long-term care. Funds come from savings and investments, as well as from the sale of one’s home. This provides consumers with another option to help pay for long-term care costs, such as nursing home care, home-based care, etc. It helps you avoid spending down or transferring assets so you qualify for Medicaid when you need help with daily activities, such as dressing, bathing, eating, etc. Medicaid asset protection protects most assets you have - up to the amount of benefits paid under the policy. Example: If the Partnership policy paid $200,000, Medicaid would allow you to keep $200,000 in assets and you’d still qualify for government help to pay for care as long as you meet all other qualifications. In 30 years, long-term care is projected to cost over $286,000 per year. That’s $858,000 to $1,430,000 for a three-to five-year care event. Center for Retirement Research at Boston College, "How Can We Improve Long-Term Care Financing," June 2008. As measured by the Consumer Price Index for All-Urban Consumers (CPI), over the 50-year period ending 12/31/10. Based on John Hancock’s Cost of Care Survey, conducted by LifePlans, Inc., 2011. Costs rounded to the nearest dollar. Based on care received for six hours a day, five days a week. Based on care received five days a week. The 9-year average annual increases are based on a comparison of data gathered from providers across the country for John Hancock’s 2002, 2005, 2008, and 2011 Cost of Care Surveys. Based on the John Hancock 2011 Cost of Care Survey and projected at the average rate of inflation of 4.1% as measured by the Consumer Price Index for the 50-year period ending December 31, 2010.